A blog for all lebanese immigrants and their friends/relatives living in the country, a new blog to talk about how expatriates see lebanon and how they describe their experiences abroad, as well as how the lebanese in lebanon reply. Does he recognize his Lebanese roots? YES, see below for more details. Main Achievement: Founder of “Kinko’s” a.k.a “FedEx Office” after its 2.4 Billion Dollars acquisition by FedEx in 2004. Nicknamed “Kinko” because of his curly hair, Paul Orfalea had a major educational problem, he was dyslexic. As a second–grade student in a Catholic school classroom, Orfalea could not recite the alphabet. His mother tried hard with numerous specialists to help Orfalea overcoming his problem but dyslexia prevented him from being a brilliant student in high-school and even in college where he majored in business. He always wanted to begin his own business and linked that to his Lebanese roots when saying in an interview: “My family is Lebanese, and when we were growing up, I never knew anybody who had a job — everyone always had their own business.” Orfalea began operating a roadside vegetable stand near his parents’ home to earn extra-money. His mother was a real Lebanese woman because of the two major things that she always wanted her son to do: “Saving enough money so you can start a business and getting enough sleep”. That’s what Orfalea did when he decided to overcome his dyslexia and decided that someday he’ll hire someone for the reading and the writing. in 1970 he began a small business in a 100$/month garage near his university campus where he sold school supplies and copies. Guess what was the name of this small business? I bet you figured out, yes, Kinko’s. 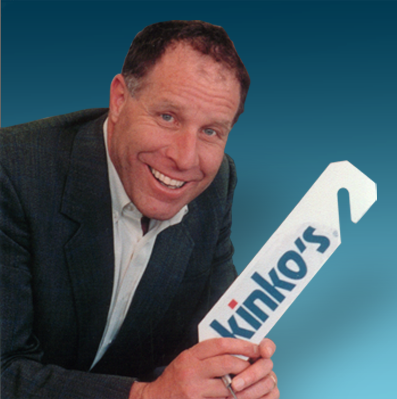 9 years later Kinko’s branches totaled 80, covering 28 states. in 2004, FedEx acquired Kinko’s with a value of 2.4 Billion Dollars. Orfalea is also a philanthropist. He founded the “Orfalea Foundation“. The Orfalea Family Foundation is committed to improving the life for children and families through learning opportunities, and to supporting sustainable systemic change in the community and around the world. Established in 2000, the Orfalea Family Foundation is a private nonprofit foundation that serves and reflects the personal choices of the Orfalea family. With the philanthropy we close this short article about a lebanese genius who overcame a lot of difficulties and made his dream come true, hoping that someday “Orfalea Foundation” will support high quality early care, education and assistance of underprivileged in Lebanon. This entry was posted in Lebanese Immigrant of the Week and tagged Dyslexia, FedEx, FedEx Offices, Kinko's, Lebanese Abroad, Lebanese American, Lebanon, Orfalea Foundation, Paul Orfalea, Startup. Bookmark the permalink. Je te la raconterai un de ces jours.